Last month, we graduated Financial Peace University. The Mister and I have committed to a written budget, and we’re paying cash for our lifestyle. If we don’t have the money, we don’t buy, right? Right. The problem is that we sat down on Monday for our budget committee meeting to write out December’s budget. Guess how much cash we have to pay for Christmas? In previous years, that wouldn’t even cover my wine. But we’ve drawn the line, and the credit cards have been cut up. So what’s a gal to do? Here’s the plan to have a very modest holiday season in which we only pay cash. We don’t usually have family to our house for Christmas, so I don’t do a ton of decorating. I do like to put a few things out though, and this year, I really wanted to display the holiday cards we receive. Enter this ladder that was thrown out down the street as part of a broken bunk bed. If the weather cooperates, I may throw some milk paint on it, but I think it’s an unexpected way to to be festive. Look around your house, and see what you already have that can be repurposed with a little holiday shine. 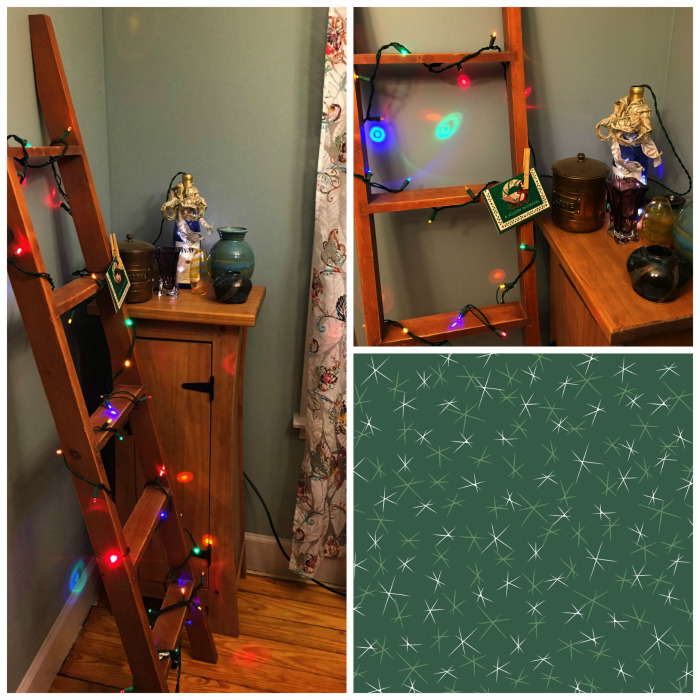 Ornaments, lights and greenery in unexpected places can bring a little holiday magic to your home without any money spent. I learned how to crochet nearly 25 years ago so it’s natural that I hook up a few gifts each year. This year we’ll be giving many more homemade gifts, so I’m getting crafty on these late winter nights. The Mister is also planning on using his carpentry skills to create some handcrafted gifts with some wood we’ve been storing. This might sounds like it’s working against the budget, but I’m talking about gift cards I already have. Right now, I have several to Anthropologie that I’ve never used. I’m betting that there are quite a few gifts hiding in their sale section. Amazon gift cards are a great idea to use for gift purchase as well. You can buy just about anything through Amazon. I’m baking Christmas cookies anyway; why not double the recipe? They make great hostess gifts. Another favorite hostess gift from our kitchen is a loaf of fresh banana bread. I’m thinking about trying my hand at a couple pie recipes this year. Another home baked gift I want to try my hand at this year is homemade dog treats for our fur babies. I’m thinking alcohol as hostess gifts again. I don’t like to show up to a party without something in hand. This time of year, I get a lot of wine as gifts, and while I like wine (do host a monthly linky about it), I like to give it as well. It might be a couple evenings worth of babysitting or maybe an afternoon helping clean a garage, but giving of time doesn’t cost money. I offered my mother-in-law an afternoon in her home office, which she’s been wanting to re-organize for years. What are your tips for reducing holiday costs? Do you make gifts or bake them?